Émile Zola was born in Paris, France on 2nd April 1840, the son of François Zola, an engineer and his wife Emilie Aubert. He grew up in Aix-en-Provence, attending the (now named) Collège Mignet, then the Lycée Saint Louis in Paris. Under the harsh straits of poverty after his father died Zola worked various clerical jobs. He then moved on to writing literary columns for Cartier de Villemessant’s newspapers. A sign of things to come he was harsh and outspoken in his criticism of Napoleon. He was also harshly anti-Catholic . One of Zola’s first works published was his autobiographical La Confession de Claude (1865), which attracted many critics and brought negative attention to him including the police. Guilt and shame haunt Thérèse Raquin (1867), another of Zola’s works to inspire many film and television adaptations. Madeleine Férat was published a year later. Zola further explores the scientific model in Le Roman Experimental (The Experimental Novel) (1880). He next wrote his Les Trois Villes series consisting of Lourdes (1894), Rome (1896), and Paris (1898). Perhaps the most sensational and certainly politically influential work of Zola’s is “J’accuse” (I Accuse!) (1898), his open letter to then French president Félix Faure. Accusing the French government of anti-semitism it was published on the front page of the Paris newspaper `L’Aurore’ (The Dawn) on 13 January 1898 in response to the Dreyfus affair, a scandal that had divided the country in two as the rest of the world watched on uneasily. Captain Alfred Dreyfus was a Jewish military officer in the French army, hastily tried and convicted of treason in 1894. Realizing their error in haste and bureaucratic bungling, the government was not willing to back down and release him from imprisonment on Devil’s Island till many years later. Zola’s article of exposure and ensuing furore led to France’s enactment of the law in 1905 that separates church and state. Zola was convicted of libel and after his internationally covered trial sentenced to a year long jail term but fled to England. He returned to France when the charge against him was dismissed. Dreyfus was exhonerated and regained full honors with the military. Back in France Zola continued writing, including his Les Quatre Évangiles (Four Gospels); Fécondité (Fruitfulness) (1900), Travail (Labor) (1901), Vérité (Truth) (1903), and Justice (unfinished). 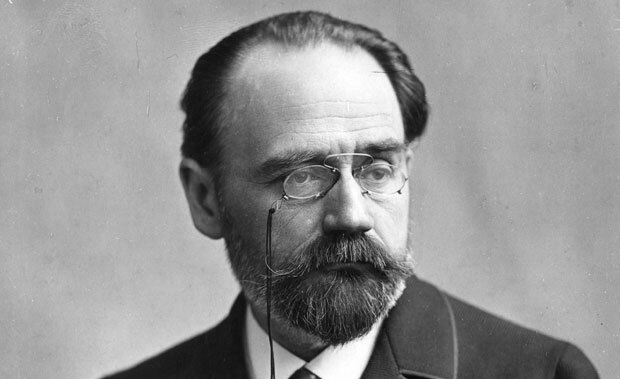 Émile Zola died on 29 September 1902 at his home in Paris under what some claim to be suspicious circumstances of carbon monoxide poisoning by stopping up his chimney. He was first interred at the Cimetière de Montmartre in Paris, then later moved to The Panthéon in the Latin Quarter of Paris, France.